Minus outstanding balances of any bonds, mortgages, notes, or other capital related debt that are attributable to the acquisition, construction, or improvement of those assets (including capital-related retainage and accounts payable). Deferred outflows and inflows of resources that are attributable to acquisition, construction, or improvement of those assets or related debt should be also included in calculation. All capital assets should be reported as Net Investment in Capital Assets, regardless of restrictions but they should not include any financial resources restricted for capital assets acquisition (e.g., unspent bond proceeds, etc.). The latter would be reported as Restricted component of net position. 4.2.8.30 If a part of the debt proceeds was spent on assets that have been not capitalized (assuming that part is immaterial), the entire amount of debt should be considered capital related. The amount of debt should be adjusted for any accumulated amounts of noninterest bearing and/or deep-discount debt discounts. Capital assets related debt should include debt issued to refund existing capital related debt. If one government issued debt to finance the capital assets of another government, this debt should not reduce the Net Investment in Capital Assets unless the capital assets are also reported by the government issuing debt. If they are not reported, the debt should be reported in the Unrestricted component of net position. If the amount is significant, government should disclose details in the notes to the financial statements. The significant amounts of unspent bond proceeds or deferred inflows of resources at the year-end should be reported as an increase of Restricted or Unrestricted component of net position, not as a reduction of Net Investment in Capital Assets. 4.2.8.30 If there is no capital related debt, the line should be labeled Investment in Capital Assets. 4.2.8.50 While a government has to distinguish between major categories of restrictions, details about unrestricted component of net position should not be displayed on the face of the statement. Designation is the management’s plan for the use of the resources and is not equivalent to enabling legislation. The enabling legislation refers to situation when a government passes a law that gives them ability to levy tax or otherwise raise revenues, and in that law, the government commits to using these resources for particular purposes. 4.2.8.60 Restricted component of net position should be reduced by liabilities and deferred inflows related to those assets. They need to be reported by the major categories of restrictions (e.g., restricted for capital projects, debt service, etc.). No category of restricted component of net position can be negative, if liabilities related to restricted assets exceed those assets, no balance should be reported. The negative amount should be reported as reduction of unrestricted component of net position. 4.2.8.70 The restricted component of net position of governmental activities may not equal to restricted fund balances in the governmental funds. The reasons are: different measurement focus and different basis of accounting. 4.2.8.80 If there are permanent funds, the restricted component of net position sets should be also displayed as expendable and nonexpendable. 4.2.8.90 Unrestricted component of net position is a default category. If the asset does not meet criteria for Net Investment in Capital Assets, and Restricted component of net position, it should be reported as unrestricted. Designations should not be reported on the face of the statement, but the details can be disclosed in the notes to the financial statements. 4.2.8.100 It is possible that unrestricted component of net position may be a negative number (e.g., significant balances of noncurrent operating liabilities such as compensated absences, net pension obligation, or pension related debt exist, etc.). 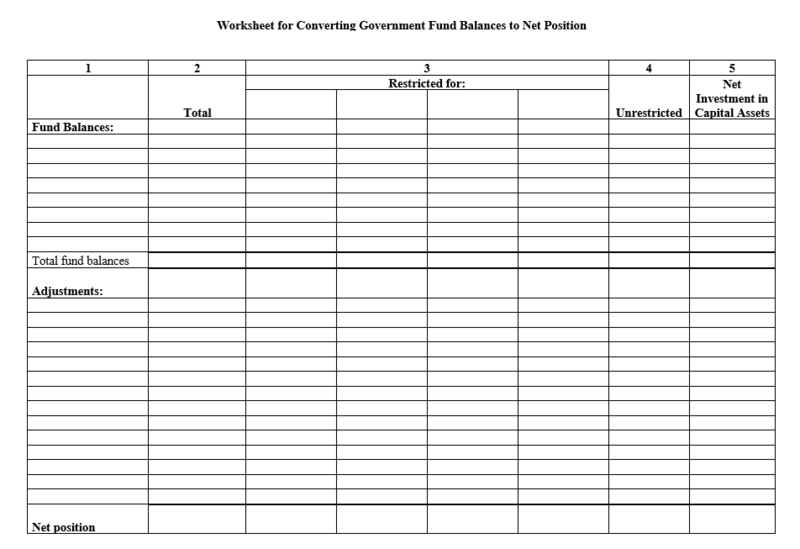 4.2.8.110 The government may use the following worksheet to convert the governmental fund balances to net position. It would be easier to use it after the fund financial statements are completed. In columns one and two list the funds and their balances. This information will come from the fund financial statements. In third column list the major categories of restrictions. Allocate the fund balances to appropriate restriction category (make sure that the amounts posted here meet the government-wide financial statements’ definition of restricted assets). All amounts that are not restricted should be posted in the fourth column. The information for the fifth column should come from the government’s capital assets and long-term debt records and can be calculated as described in 4.2.8.31.